Good Choice Reading: Barefoot Season Vacation basket giveaway! Barefoot Season Vacation basket giveaway! Author Susan Mallery is running yet ANOTHER awesome giveaway! 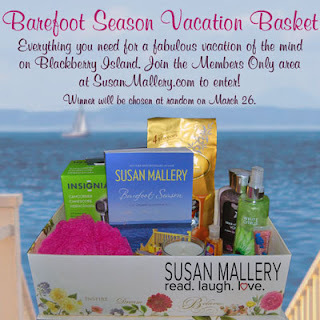 On March 26, Susan is giving away a Barefoot Season Vacation Basket to a randomly chosen Member of her mailing list. All you have to do is sign up for her MEMBERS ONLY newsletter on her site and it automatically enters you. It is FREE to sign up. Cool, right?!?!? What are you waiting for? ENTER HERE! Ooh, yummy! Thanks for the share! This is absolutely wonderful! It's not just a book (altho it should be a great one), it's an entire experience. Thanks for the chance to win it! !